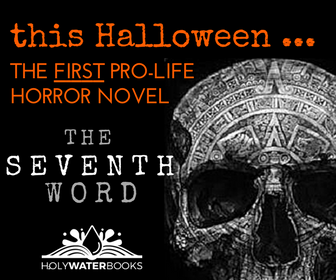 the first ever pro-life horror novel! WHAT LIES BENEATH THE STARCHED WHITE MASKS? A horror thriller about the residents of a small town chosen to confront the evil lurking beneath the starched white masks of an abortion facility. The First Word came with Cain, who killed the first child of man. The Third Word was Pharaoh’s instruction to the midwives. The Fifth Word was carried from Herod to Bethlehem. One of the Lost Words dwelt among the Aztecs and feasted on their children. Evil hides behind starched white masks. The ancient demon LaColt conducts his affairs in the sterile environment of corporate medical facilities. An insatiable hunger draws the demon to a sleepy Louisiana hamlet. There, it contracts the services of a young attorney, whose unborn child is the ultimate object of the demon’s designs. Monsignor, a mysterious priest of unknown age and origin, labors unseen to save the soul of a small town hidden deep within Louisiana’s plantation country, nearly forgotten in a bend of the Mississippi River. You'll be gripped from start to heart-stopping finish in this page-turning thriller from new author S.L. Smith. With roots in Bram Stoker's Dracula, this is a horror novel which reads like Stephen King's classic stories of towns being slowly devoured by an unseen evil and the people who unite against it. The book is set in southern Louisiana, an area the author brings to life with compelling detail based on his local knowledge. read wHAT others are saying about the seventh word!